That day we had -18 C, but even the frosty weather didn’t stop Krasnoyarsk dwellers & city guests from coming to Fun Park & join to the whole world in celebrating World Snow Day! Fun, warmth & happiness that were the key words of the day! 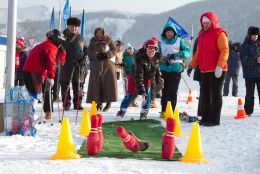 225 ski resorts from 39 countries all over the world, among them 5 resorts from Russia including Fun Park “Bobrovylog” as well, joined together with the great idea –to tell children & their parents about winter sports, to show them all the fun, happiness & benefits that such activities bring to people notwithstanding age & physical strength. World Snow Day in Fun Park “Bobrovylog” was spent on sports note! There have been organized different active locations on snow. Also during the day all the guests could participate in ski & snowboard races for amateurs of all ages. The day started with All-Russian Kids’ Snowboard Race for youngsters 11-15 years old & simultaneously there was held a competition called “Snow Bobronauts” for little ski & snowboard fans aged 4-10 years old! “Snow Bobronauts” competition gathered 48 young participants, who had to ride 100 metres as quick as possible. 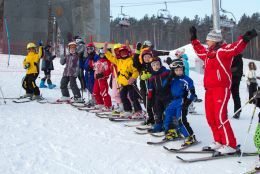 All-Russian Kids’ Snowboard Race gathered 58 participants from Khanty-Mansyisk, Kamchatka & Krasnoyarsk region. After young sportsmen’ award ceremony FUN CUP (IInd stage) picked up the slack. Nonprofessional ski & snowboard annual competition initiated by FunPark Bobrovylog this time was held in individual & team classifications, where team members were relatives. All in all there were 78 individuals & 10 family teams. All the participants got presents from Fun Park “Bobrovylog” & it’s partners. Actually, to win a memorable present that day the one could not only by participating in competitions, but in quizzes, lottery games & other locations as well. There were organized several open-air winter game zones for children & their parents called “Snow-mania”. During the day family members could measure their strength in biathlon-darts, hockey, bowling in felt-boots. For those who are fond of figure skating Fun Park prepared several master classes on skating rink from the Master of Sports in figure skating Elena Potylitsina. Everybody could learn basic figure skating elements & combinations. In addition, during the day world famous ski brands equipments’ test season 2012 was available on the Fun Park territory. “To sum up, we could say, that the holiday was successful! While preparing there had been a slight worry concerning the weather. 22nd of January in Siberia is usually a period of so-called “Hard frosts”, but luckily, after long-lasting -30C we had only -18C on 22nd & it turned out to be a great present for the Krasnoyrsk dwellers & everybody who prefers active rest!- commented on Elena Gavrilova, Fun Park “Bobrovylog” general director,- We’ve got a lot of pleasure while participating in such a project. I think, celebrating World Snow Day here in Fun Park will become our good tradition & we will add it to the list of Fun Park annual events”.